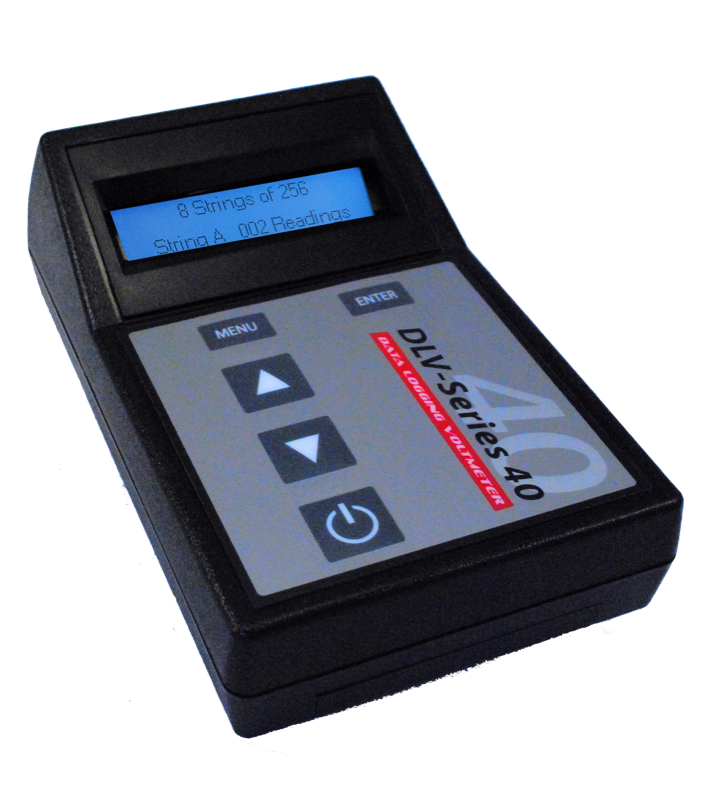 The DSG-30 Hydrostik enables the user to collect and store up to 2048 specific gravity and temperature readings from batteries that have a 5/16" corner access tube. Memory capacity is 8 strings of 256 readings. The user can then quickly and easily upload the test data to a PC/Winmeter 5.1 Battery Analysis Software via a RS232 PC interface. 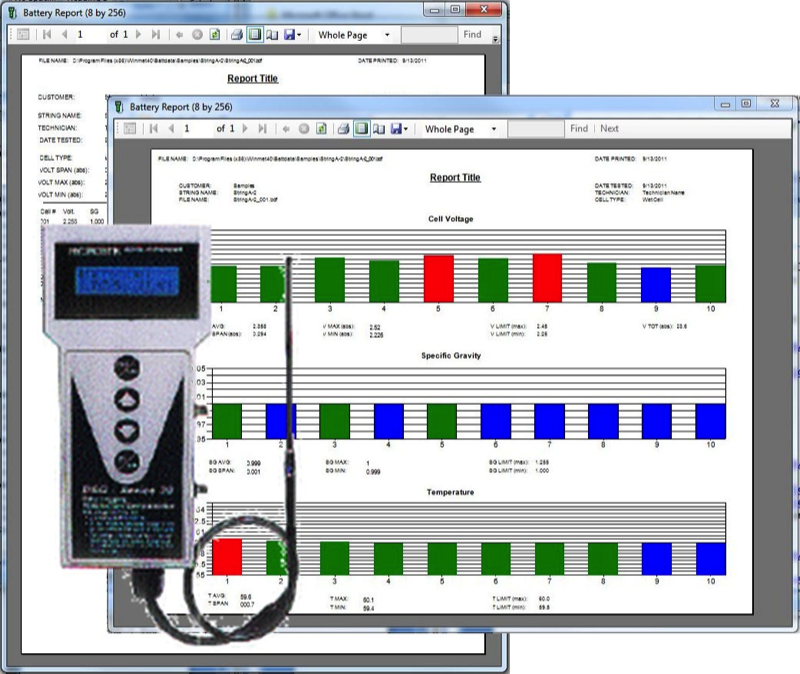 Winmeter 5.0 battery analysis software is included with the instrument and has a powerful report generation and database capabilities; enabling the user to identify batteries that are likely to require preventative maintenance. 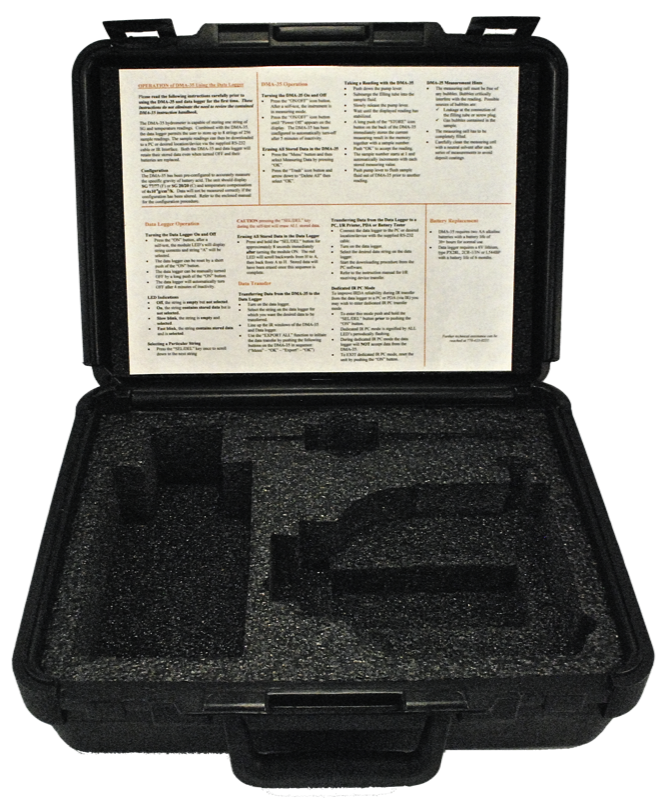 Collect and store up to 8 strings of 256 specific gravity and temperature readings. Measure specific gravity and temperature in less than 5 seconds. Specific gravity temperature is automatic and the unit is preconfigured for 77/77 F or 20/20 C.
Splash proof membrane keypad for robustness. 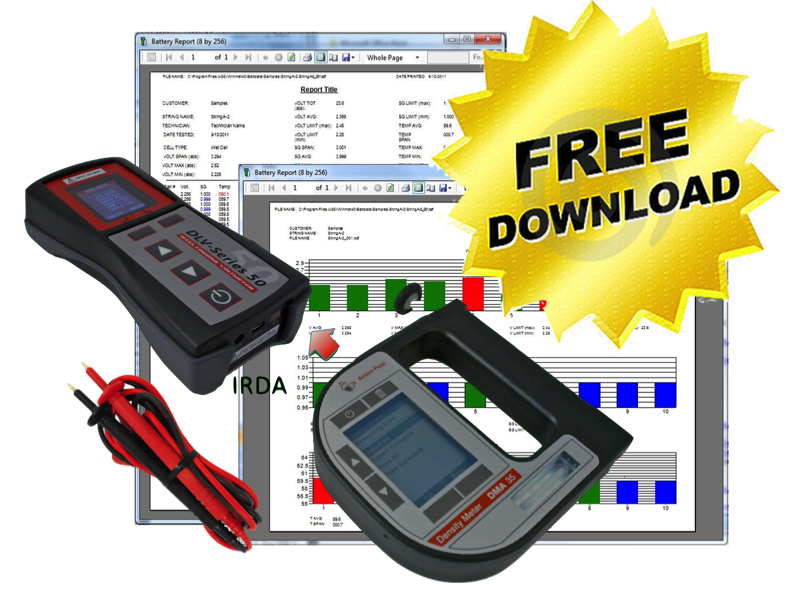 Download hydrometer data to the Winmeter 5.1 Battery Analysis Software. 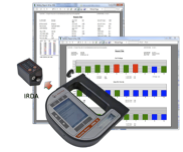 Upload both instruments separately with Winmeter 5.1 software. 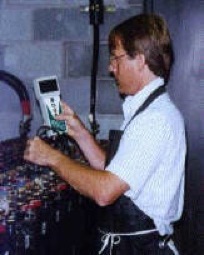 Combine cell voltage, specific gravity & temperature readings with Winmeter 5.1 software into one battery test report. New customers should consider purchasing the DMA35-DLV50-BATT battery test package. Connect to PC (via RS232) to transfer data files to Winmeter 5.1 software. IMPORTANT NOTE: The DSG30 Hydrometer requires batteries that have at least a 5/16" corner access tube. Specific Gravity Measurement Range: 1.000 to 1.325SGU @ 77F/77F. Temperature Compensation Basis: 77F (25C). Specific Gravity Accuracy: +/- 0.004SGU. Calibrated Temperature Range: 50 to 110°F @ +/- 2F (larger ranges upon request). 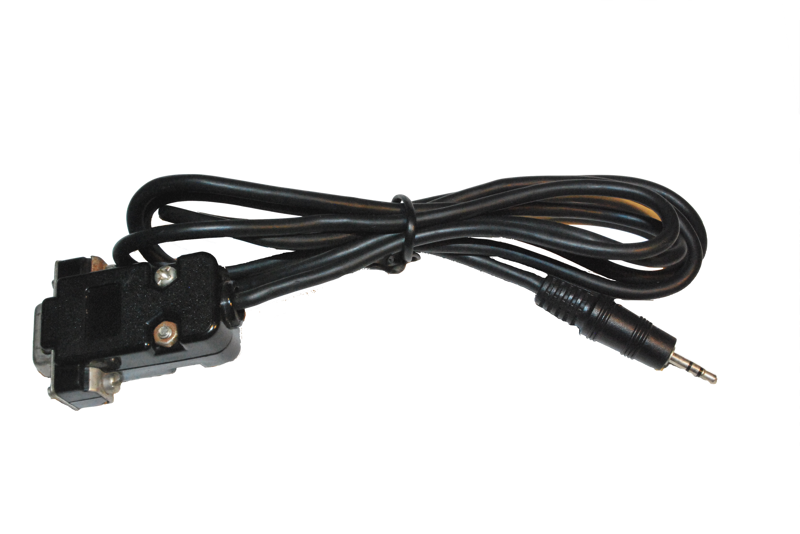 Max/Min Ambient Temperature: 50F to 100F (will work outside range with decreased accuracy). Enclosure Dimensions: 8.25” x 3.875” x 1.5”. Power Requirements: Four AA Batteries (Alkaline). Memory Capacity: 2048 readings (8 strings of 256). Memory Integrity: 10 years (with battery removed). 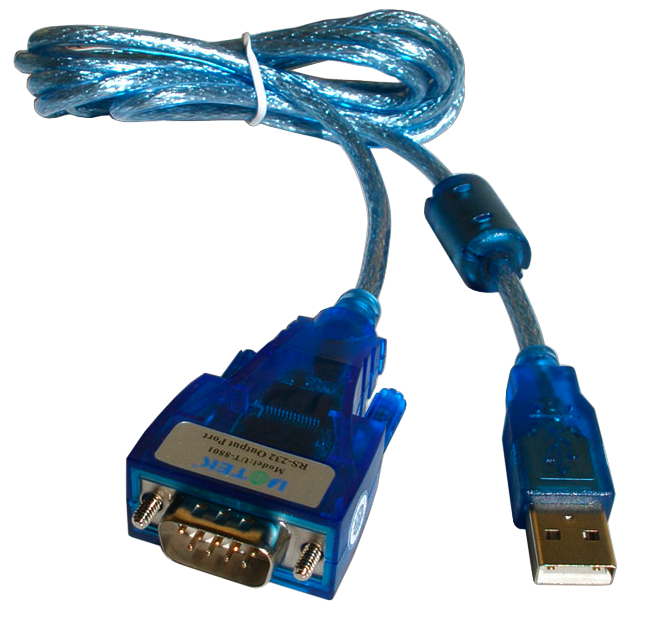 Computer Download Interface: Half-duplex RS232C.